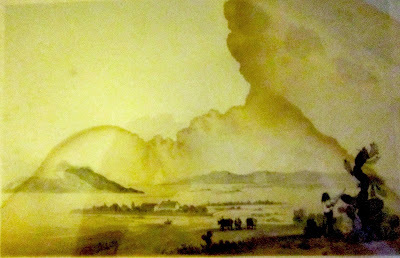 Though heavily water damaged, this hand-tinted print, entitled Mission And Plain Of San Fernando is an important addition to the Archives of The Museum of the San Fernando Valley. Part of a survey conducted by the United States Pacific Railroad, the print is one of the earliest images of the San Fernando Valley. It is a gift to The Museum Community from Gary Fredburg 2011. What appear to be great rain clouds at the right side of the print are stains from water damage. Look at the native American picking cactus pairs at the right. Between the viewer and the Mission buildings there is a man on horse back, work looking at closer. This from "Reports of Explorations and Surveys, to ascertain the most practicable and economical route for a railroad from the Mississippi River to the Pacific Ocean, made under the direction of the Secretary of War, in 1853-4. Volumes I-XII". This should be in volume 5, which talks about San Fernando Pass on page 35.